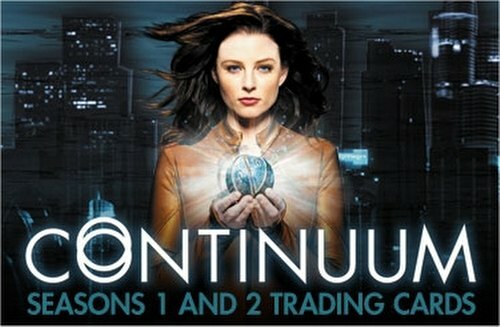 Each Continuum Seasons 1 & 2 box will include 2 autograph cards and 1 relic card! Autograph signers include Rachel Nichols, Erik Knudsen, Tony Amendola, Omari Newton, Luvia Peterson, Richard Harmon, Victor Webster, Stephen Logo, Roger Cross, Brian Markinson, Jennifer Spence, and Janet Kidder. 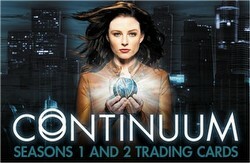 The base set includes 72 cards featuring photos and plot synopses for all 23 Season 1 and 2 episodes. Collectors can also look for gold base parallel cards, Continuum Stars cards, Continuum Future Tech cards, Continuum Character cards, and more. Each case includes a Future Self card depicting Alec Sadler and Julian Randol. Case incentives include a 2-case Keira Cameron Polymeric Nano-Suit Relic card, a 4-case Rachel Nichols/Erik Knudsen Dual Autograph card, and a 12-case Archive box.